@Sarah – No, that is pretty standard. It has to do with anti-money laundering laws. He will have to give the money to you first or alternatively set up his own RESP account and contribute directly to that. I had to give grant back because i withdrew from 2 financial institutions. What are the limits here? I have a question about the timing of contributions to an RESP plan. Does it run based on the calendar year? For example, my daugther was born in July 2012. Can I contribute $2500 now in December 2012 and then another $2500 in January 2013 and get the full CESG for both years? We have a relatively small RESP ($42,000 – $30,000 in contributions and the rest in grants and earnings) setup for our only daughter, currently in 1st year of university. When she started University this past fall we withdrew the max 5000 as an EAP. She is not working at the time but earned approx $4000 over the summer. I guess her income will be $9000 ($4000 summer job and $5000 EAP) and her tuition is approx $4500. I’ve justed passed the 13 week holding period and am wondering if I should withdrawl all or a portion of the available EAP (balance available to withdrawl $7,000 (42k-30k less 5k already taken out). Thinking of moving the money into a TFSA for her. Your thoughts? My son has used a portion of the RESP we set up for him. We still have a small amount of money left in it and he has been taking a course to upgrade in the evenings. Could we dip into his RESP to pay for this course? He is 20 yrs old and works full time but still lives at home. What can you tell me about conversion of group RESP ? We were approached by our Heritage sales rep who recommended we do a conversion of our RESP plan into a “lump sum ” plan and a new annual plan. We are in our 13 th year of RESP contributions and our last contribution date is in 2017. She said this conversion will increase the potential value of our RESP without having to invest any additional funds. At least that was what both my husband and I were led to believe. There is nothing about this in the prospectus and when we looked through the details on this plan adjustment we noticed that we would need to add 2 more annual contributions to gain an extra 8.75 units. In other words our last contribution date has been moved to 2019. In the end we decide to cancel this conversion plan. I just want to know your thoughts on this. I have four sons. My wife and I deposited $3000 per year for 3 years into a joint RESP account for the boys. To date none have expressed interest in attending College. Three of my boys are following the Trades and are registered apprentices. Their school fees each year are avout $900 for the technical training the require. Are these fees legitimate for RESP withdrawls? 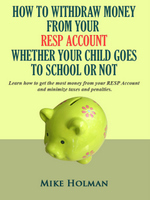 can you cancel and withdraw contributions made to an RESP? Hello – my ex husband informed me he wants to open up an RESP account for our son (8 yrs) and wants me to sign some papers. Can i be a joint beneficiary on this account and will i need to make contributions as well? @Elli – You can be a joint owner on the account if you want, however you don’t have to. To open up an RESP account the financial institution needs the permission of the primary caregiver which is why he needs your sig. There shouldn’t be obligation to make payments. Make sure the RESP is a not a group/pooled plan. My wife and I have several RESP accounts for our grandchildren. We are not pleased with the provider and would like to change to another, for example a bank. Can we do this while maintaining the current balances and without incurring any penalties from the original provider? 1) If there are 2 separate RESP accounts open for a child, 1 by the maternal grandparent& 1 by the paternal grandparent can both be designated to receive the Government grant. 2) If an RESP account is opened for 1 child by a grandparent can another child be added as a beneficiary to the existing account. I recently opened an resp account for both my children. One is 10 and the other 3. I was informed that in order to qualify for any grants from the government each child would need a separate account. I no longer believe his is true but regardless I have two resp accounts. I would like to know if I can add one child’s resp to the other or simply have a beneficiary added to the other? In case one doesn’t use it the other one can take full advantage of the money contributed. The NS loan cap was announced after we finished contributing to his RESP so we don’t fault ourselves for making that decision but now I would be very hesitant to recommend RESPs to any NS family unless they qualified for the Canada Learning Bond. Families whose income is too high to qualify for the maximum federal student loan should also consider contributing to an RESP to gain the CESG. (My very back of the envelop calculations plus the CanLean parental contribution calculator predicts that could happen after the parental income exceeds $126,000.). I don’t have a crystal ball to predict how long the NS student loan cap will exist in its current form but for now other NS families, whose students won’t be living at home, might be better advised to save money outside of an RESP and then gift it to their student when they are ready to pay off that $28560 loan. I have been contributing to Group RESP Plan for my son for last 11 years. In near future we are going to be non resident of Canada. I know that if my son becomes non resident then I can’t contribute. I would like to stay in the plan. Is it possible that stay in the plan by converting it into paid in full status? Is this status can be achieved by reducing number of units and not contributing any further? Please advice. ($2500 for 2013(Catch up) and $2500 for 2014). So the total my son should of obtained from the federal grant was $1000 and for the provincial grant he received $500. However, he only received $750 for the federal grant, should it not be $1000? Additionally, my daughter is in the plan along with my son, as apart of a family RESP. We contributed $2500 for my daughter for 2014, and she received the $500 federal grant. My question, should my son receive an additional $250 federal grant? I have contributed RESP of my son for 10 years. In year 2014, my son joined medicine in India and his medical college is not in the approved list of RESP. Please can you advise how to register the college in RESP list. I made a lup sum payment of $4000.00 dollarswhen my son was 13 , he decided to join the military and did not use it. Since I have been trying to get it back . My question is on this investment should I expect to get back the $4000 and some interest or like the company said I will get back $ 2100 AND $1200 put in my rrsp. Hi , my son dropped out school from is university in December , hoping to change in January, however he did not get accepted in time so he took the year off to attend school he wanting in September. Now he is in the program and school he wants. There telling me i need give them a transcript of his previous school to real release money but ; mistakenly i put one academic year completed . What should I do? I have a family RESP for my two kids. Both are in university but I have not started withdrawing yet, largely because the self-directed RESP account is in a big loss position. Basically, I was too aggressive in my investing, thinking I had 20% of the government’s money to play with and got burnt. Overall contributions were approximately $30,000 and the account is currently worth about $20,000. In addition to the capital losses, there would be a little bit of capital gains (which I assume are off-set by the losses) and some dividends earned over the years. My question is: given I have contributed $30,000 and the account is currently worth $20,000, am I allowed to treat the entire $20,000 as “contribution” or will the dividends and grants earned in the account count as “accumulated income” and take priority over the contributions. If you don’t want your daughter paying income tax on the EAPs you should remember 3 points. 1/ The basic personal exemption for some provinces is lower than the federal one. For example, in PEI for 2015 it is $7708. 2/ The tuition tax credit is only for the portion of the tuition charged for the tax year. Therefore a student who begins college or university in the fall may pay tuition for 2 terms but, in the first tax year, they will only be able to claim the fall term tuition. So for example, if Wally’s daughter files her 2015 income tax return in PEI (where the education amount is $400 per month) the provincial non refundable credits for one term of university would be would be the basic personal amount + one term of tuition + the education amount. Or $7708 + $2250 + $1600 = $11558. If she already has $9000 in income (from employment and the EAP) than she could be paying provincial income tax if her father makes an additional EAP withdrawal of more than $2558. If he withdraws the full $7000 she would be paying provincial tax on $4442. We are canadian and our children are dual american/canadian. Our eldest is starting university in the Fall 2017 and then the youngest Fall 2018. Should we withdraw the EAP portion more slowly to minimize tax burden? Neither will have any other earned income.. I have set up two RESP for my newborn child. I met an fund advisor who have setup the holdings for each accounts. I am not certain of the rate of return for each RESP and i would like to know how the government grants (Provincial and Federal) will be applied due to my contributions. we have to kids age 13 and 15 and a family RESP. What would be the max. monthly contribution for both of them to be matched by the government grant? We also haven’t always paid into the RESPs since we opened them. Can we still make up for that and will the government add the 20% grant for “late” contributions?